Just 48 hours left now, and less than 10% left to go! Thanks so much to everyone who’s helped us get this far, we really and truly could not have done this without you. We’ve very grateful for everyone who donated to or shared the project, every single one of you! But we’re not quite done yet, we still have a little ways to go before we can rest. Please keep spreading the word! If you haven’t donated yet, please consider donating a little, every bit helps no matter how small! And if you already donated, hey, take a look at the new rewards we’ve added in the past couple weeks and see if anything tickles your fancy! You can always upgrade. Now onto our second-to-last update! Wait, huh? Did we slip into an alternate reality where Sneaky Ninja was actually developed for the NES? 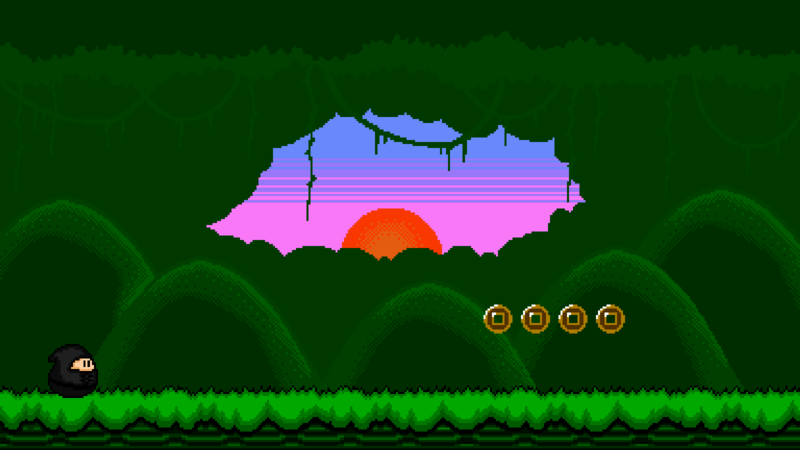 Oh, right, that’s just concept art for the 8-bit bonus levels! These levels are a stretch goal which, as always, we’ll try our hardest to get into the game either way. They’d be filled with retro goodness, with all the pixels and chiptunes you could want — because what indie game would be complete without some 8-bit? When you hit the gong at the end of each level, you have to time your swing to the ninjas bouncing on the drums, with bonus points awarded if you time it well. Get a few well-timed hits in a few levels and you’ll unlock an 8-bit bonus level! These are divided into different types, like pure stealth challenges where you fail instantly if you get spotted, pure platforming challenges that test your jumping abilities like an old-school NES game, or other more random types like a stealth level from a top-down perspective or a rhythm game! We have a lot of ideas for fun levels that can add a lot of variety and surprise to the game, so we’re very excited to start making them! This is for a platforming section so it’s more fast-paced — each type of bonus level will have its own chiptune best suited for it. Regeria Hope is love letter to the Phoenix Wright series, with a few big twists! It takes the same style of visual novel gameplay with courtroom drama and adds some story-branching decision making to it, giving you the choice of accepting bribes and throwing the case instead of defending your client. Characters’ reactions to you as well as the story itself will change based on your choices! Check out Regeria Hope’s Kickstarter here!